The Legend of the Hero is a new animated Chinese film aimed at kids. Online in China, it has people talking. But they're not exactly saying nice things. The movie apparently cost the equivalent of roughly US$1.9 million dollars to produce—something that is even flooring people in China. In comparison, the average 90 minute animated Chinese film costs under $30,000. 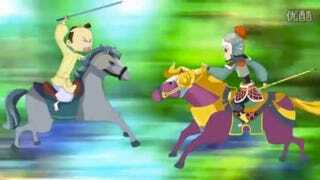 The Legend of the Hero follows the great Ming Dynasty general Qi Jiguang and opened in China on June 1, Children's Day. The government apparently helped fund the project, but it is trying to distance itself. I would, too. The movie looks so awful that people in China have been talking to the internet, wondering why this appeared in theaters and saying it looks like it was made in Flash. "How they hell do you spend so much money on this?" wrote one. The movie is an embarrassment in China, where those working in the animation business see this as a knock on the country's reputation. China already knows it's "still lagging" in animation, but it is keen to catch up. Recently, Disney announced it would be launching a joint initiative in China to help pass on expertise and develop local talent. If this feature is anything to go on, boy, Disney has its work cut out for itself.